Signs of captioned photo book pages first appeared in v3.22, but they're now live in the latest update. 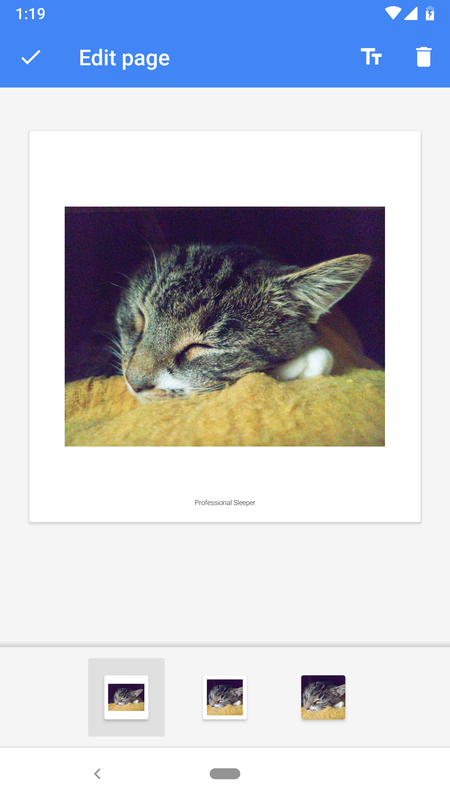 To add a caption to a page, simply open a photo book from your drafts (or create a new one) and look for the new text tool button in the title bar to open a window with a text field. You can also tap on the bottom portion of the white border surrounding a photo to open the same view. As you enter text, a preview will show up in the sample page above. Photo pages don't allow the lines to wrap, so you'll get a warning if the line gets too long. Also, captions are only allowed in the layouts with a border, not in the full edge-to-edge layout. There was one small change I had left over from checking v3.25, but it didn't really warrant a dedicated post. 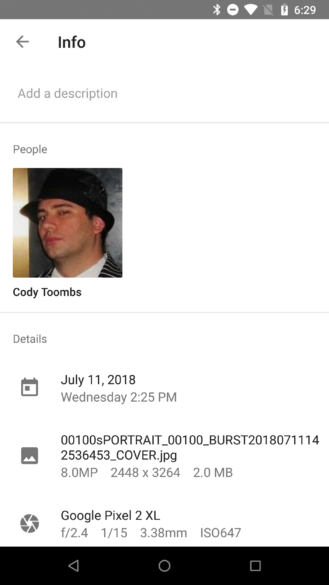 The info screen on photos was reorganized to bring the details of the photo to the top of the page, effectively displacing recognized faces. If there is a location attached in the metadata, the map view is still located at the very bottom if you scroll down to look for it. Otherwise, nothing was gained or lost in the change. Photos and videos have come a long way in the last few years, but most of the interesting new features and variations of them haven't strayed too far from the traditional notion of flat images on a screen. 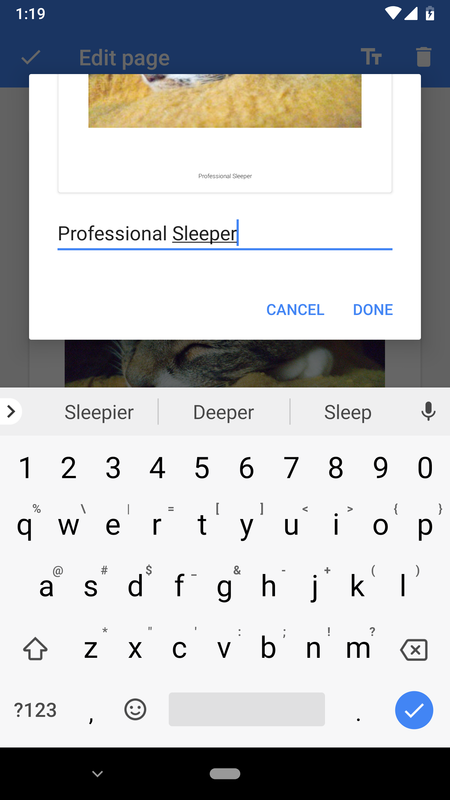 However, Google Photos appears to be taking its next step by enabling edits to VR media. The new lines are part of a message that's shown when editing a stereoscopic image. These are really two images taken from slightly different angles and then shown to a viewer's eyes independently, allowing them to perceive depth in the way their eyes would when viewing something in three-dimensional space. The message indicates that the edits are only previewed with one of the two images, but the changes will be applied to both images in the pair. At this point, there's no clear indicator for exactly which types of edits can be made to stereoscopic images, but it's pretty safe to assume color adjustments will be allowed. I'm not so sure about things like cropping or rotation, which would probably screw up the perspective shift. I don't have a camera that can produce a stereoscopic image, so I've got no good way to test if this is working yet. Of course, we welcome any readers with capable cameras to try this out and let us know if it's already live. 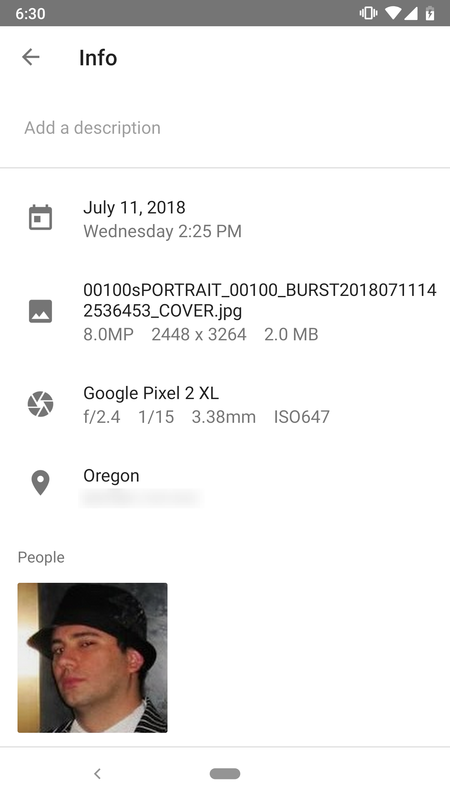 During Google I/O, there were announcements for new suggested actions that would appear as you browse your photo collection. There aren't a lot of different suggestions, but the list has been slowly growing since the announcement. Now two new suggestions appear to be incoming: Fix Color and Crop Document. It's not hard to guess that the Fix Color suggestion will probably work quite a bit like the Fix Brightness suggestion, basically detecting things like a questionable white balance or colors that are over or under saturated and adjusting them to more appealing norms. The Cropping suggestion makes sense from the perspective that it's almost always good to crop an image at least a little bit, but it's hard to say exactly what Google Photos will be looking for to identify images that specifically warrant some fine tuning. It's possible it will detect faces or other subjects in the frame and offer to crop the images to place them in golden ratio positions, or perhaps it will identify unsightly details on the edges of an image that wouldn't be missed if they were removed. So far, none of the images I've checked have produced these suggestions, so I'm assuming this isn't live yet, but again, let us know if you spot either of these popping up on your shots.